Wholesale trade contributed $71.1 billion to Canada's GDP in 2011, an increase of 3.2%. Retail trade contributed $76.9 billion, up 1.6%. In contrast, the GDP for all industries reached $1,266.5 billion, a 2.6% increase from 2010. 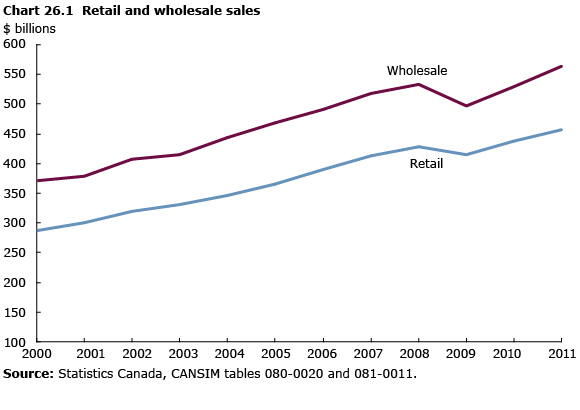 Payroll employment in wholesale and retail trade increased by 0.4% to 2.6 million workers in Canada, falling behind the 1.7% average increase for all industries in 2011. The largest gain in employment was 19.5% in Nunavut, followed by 2.7% in both Prince Edward Island and Alberta. Payroll employment decreased in two provinces, Quebec (1.3%) and Nova Scotia (0.1%). Wholesale employment rose 1.9% to 743,259 workers, led by a 15.0% growth in petroleum product wholesaler-distributors, followed by motor vehicle and parts wholesaler-distributors (4.2%), and machinery, equipment and supplies wholesaler-distributors (3.7%). Employment declined in 2 of 9 subsectors: food, beverage and tobacco wholesaler-distributors (0.5%) and personal and household goods wholesaler-distributors (1.4%). Wholesale weekly wages were highest in Alberta ($1,246), the Northwest Territories ($1,223), Ontario ($1,100) and Saskatchewan ($1,061). The largest increases in wholesale wages in 2011 were in the Northwest Territories and Alberta (9.0%), Saskatchewan 8.4%), New Brunswick (7.4%) and Prince Edward Island (7.0%). The only province where wages fell was Quebec (0.3%). Retail employment fell by 0.2% to 1.8 million workers. Electronics and appliance stores increased employment by 12.1%, followed by clothing and clothing accessories stores (2.2%), building material and garden equipment and supplies dealers (1.5%) and motor vehicle and parts dealers (1.3%). Employment fell in 4 of 12 subsectors, led by declines in food and beverage stores (3.6%) and sporting goods, hobby, book and music stores (3.0%). Employment in non-store retailers rose 6.3% to 23,265 workers. Retail weekly wages were the highest in the Northwest Territories ($689), Yukon ($568), Alberta ($559) and British Columbia ($529). The largest increases in retail wages in 2011 were in Nunavut (10.3%), Yukon (8.9%) and the Northwest Territories (6.9%), followed by Newfoundland and Labrador (5.8%) and New Brunswick (4.7%). Retail wages did not decline in any province in 2011. On an annual basis, wholesale trade merchants' sales rose to $564 billion in 2011, up 6.6% from 2010. This increase has held steady for the past two years, following a decline of 6.9% from 2008 to 2009. All seven subsectors in wholesale trade saw increases in 2011. Growth was led by machinery, equipment and supplies wholesaler-distributors (11.0%), miscellaneous wholesaler-distributors (13.2%) and food, beverage and tobacco wholesaler-distributors (5.5%). The motor vehicle and parts subsector, which experienced the greatest increase in 2010 (12.0%), recorded slower growth in 2011 (4.3%). Sales in this subsector may have been affected by the supply disruptions stemming from the earthquake that struck Japan in March 2011. Wholesale trade merchants' sales rose in all provinces. Saskatchewan recorded the largest growth rate with a 22.7% increase, followed by Alberta with a 15.0% rise. Ontario and Quebec had the highest sales by volume, but their growth, at 4.8% and 5.3% respectively, was slower than the 6.6% national average growth. Retail stores sold $456.4 billion in goods and services in 2011, a 4.1% increase from 2010. This followed over two decades of increasing sales with a single annual decline in 2009. The largest categories were food and beverage stores ($104.1 billion) and motor vehicle and parts dealers ($100.0 billion). From 2010 to 2011, retail sales rose in 8 of 11 retail subsectors. The highest rates of growth were observed by gasoline stations (18.2%), motor vehicle and parts dealers (4.8%) and clothing and clothing accessories stores (4.2%). Building material and garden equipment and supplies dealers had the largest decline, 2.4%. Retail sales increased in all provinces and territories. The largest contributors to the increase were Ontario (3.6%), Alberta (6.9%) and Quebec (2.9%). In 2011, automotive fuels, oils and additives accounted for the largest increase (20.6%) in sales of commodities sold in retail stores. Retail sales of motor vehicles, parts and services were also up (5.3%). Most of this gain came from higher sales of new trucks, vans, minivans and sport-utility vehicles. Food and beverage sales increased 2.3%.